"You will become like us!" Upgrade your Cyber Legion with this Exterminate! expansion pack. 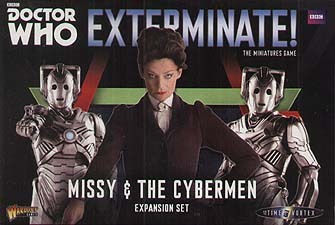 Missy & the Cybermen gives you twelve easy-build plastic Cybermen miniatures and an exclusive metal miniature of Missy - the latest incarnation of the renegade Time Lord, the Master. In addition, new Recruitment and Adventure cards allow the Cyberman faction to upgrade their weapons and armour move at time-distorting quicksilver pace or cyber-convert opponents into new warriors for your faction. Missy and her unique Adventure cards will also prove invaluable to the Cybermen bringing Time Lord guile and invention to their mission to upgrade the Universe! These highly detailed plastic Cybermen miniatures are 'push-fit' allowing them to be easily built without glue. Models supplied unassembled and unpainted. Paints and not included.